Background and objectives: Controlling serum potassium is an important goal in maintenance hemodialysis patients. We examined the achievement of potassium balance through hemodialysis treatments and the associated fluctuations in serum potassium. Design, setting, participants, & measurements: A 3-yr (July 2001 to June 2004) cohort of 81,013 maintenance hemodialysis patients from all DaVita dialysis clinics across the United States were studied. Nine quarterly-averaged serum potassium groups (<4.0, ≥6.3 mEq/L and seven increments in-between) and four dialysate potassium concentration groups were created in each of the 12 calendar quarters. The death risk associated with predialysis potassium level and dialysate potassium concentration was examined using unadjusted, case-mix adjusted, and malnutrition-inflammation–adjusted time-dependent survival models. Results: Serum potassium correlated with nutritional markers. Serum potassium between 4.6 and 5.3 mEq/L was associated with the greatest survival, whereas potassium <4.0 or ≥5.6 mEq/L was associated with increased mortality. The death risk of serum potassium ≥5.6 mEq/L remained consistent after adjustments. 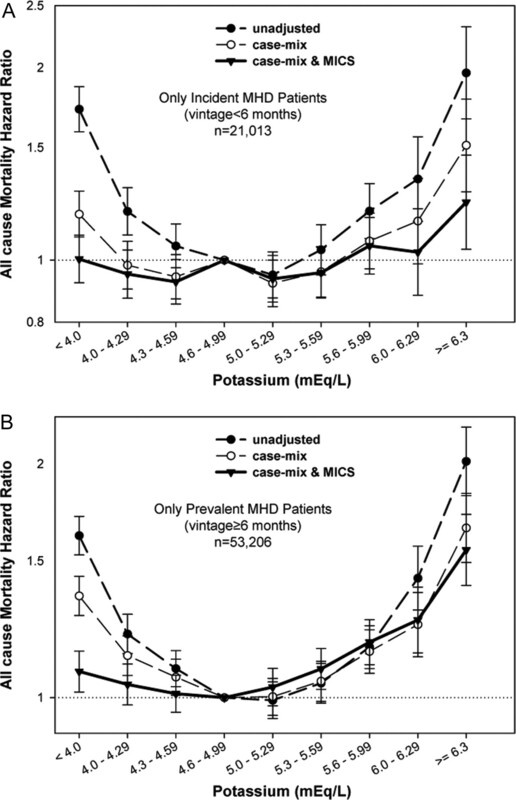 Higher dialysate potassium concentration was associated with increased mortality in hyperkalemic patients with predialysis serum potassium ≥5.0 mEq/L. Conclusions: A predialysis serum potassium of 4.6 to 5.3 mEq/L is associated with the greatest survival in maintenance hemodialysis patients. Hyperkalemic patients who undergo maintenance hemodialysis against lower dialysate bath may have better survival. Limitations of observational studies including confounding by indication should be considered when interpreting these results. 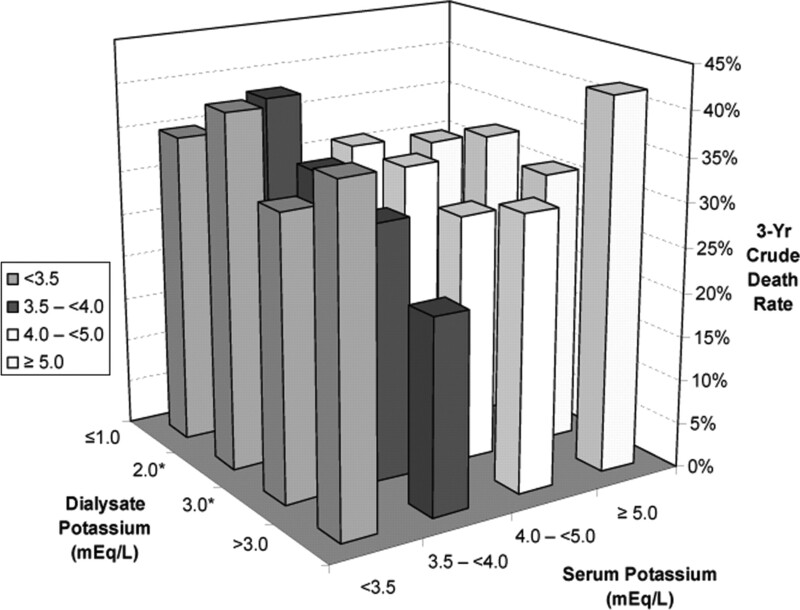 Alterations in serum potassium (K) are common in patients with chronic kidney disease (1,2). Progression of chronic kidney disease is usually associated with worsening hyperkalemia that may require dialysis treatment (3–7). However, intermittent hemodialysis may result in fluctuating serum K levels, which at the extremes can reach pathologically high or low concentrations. Predialysis hyper- and hypokalemia have been implicated as a correlate of death risk in maintenance hemodialysis (MHD) patients (1,2). The high incidence and prevalence of cardiovascular disease and death—including sudden death—in MHD patients makes such an association clinically relevant, especially because significant electrophysiologic alterations may result from serum K variations. However, a confounding effect of other factors associated with the presence or the treatment of hyper- and hypokalemia is also possible. It is not clear which range of predialysis serum K is most beneficial in MHD patients. A high-normal serum K level could offer a survival advantage by being less arrhythmogenic. It is also unclear what the ideal dialysate K concentration should be. Indeed, dialysate baths with higher K concentration could be assumed beneficial by virtue of inducing less fluctuation in serum K levels. However, a high dialysate K concentration might be associated with more frequent episodes of hyperkalemia and its deleterious cardiovascular effects. We studied a large and contemporary national cohort of MHD patients to determine the association between predialysis serum K levels and all-cause and cardiovascular mortality. We examined these associations using time-dependent Cox models based on time-varying repeated measures. We also evaluated the impact of the treatment for serum K abnormalities by examining the associations between prescribed dialysate K concentrations and the risk for death. The database creation has been described previously (8–10). In summary, the data warehouse of DaVita, Inc., the second largest dialysis care provider in the United States with >600 dialysis facilities and approximately 40,000 patients at any given time across the country (before the acquisition of Gambro dialysis clinics in 2005), includes comprehensive information on virtually all of its patients. A 3-yr cohort (July 1, 2001, through June 30, 2004) of these patients was studied. All repeated measures of every relevant variable for each patient within the any given calendar quarter (13 wk) were averaged to obtain one quarterly mean value for that variable. The study was approved by institutional review committees of Harbor-UCLA and DaVita. Cohort time included the number of days the patient participated in the cohort and was a number between 1 and 1095 d. Dialysis vintage was defined as the duration of time between the first day of dialysis treatment and the first day that patient entered the cohort. Four categories of vintage were formed: (1) First 6 mo, (2) between 6 and 24 mo, (3) between 2 and 5 yr, and (4) >5 yr. The first group is referred to as “incident” patients and the last three groups “prevalent” patients. The entry quarter was defined as the first calendar quarter in which a patient's dialysis vintage was >3 mo for at least half the duration of the given calendar quarter. By implementing this criterion, any patient who had not maintained participation in the cohort beyond the first 45 d of MHD was excluded. The causes of death, obtained from the computerized database, reflecting the reported information in the Cause of Death form (Form 2746), were obtained and summarized into six main categories: Cardiovascular, infectious, gastrointestinal, cancer related, others, and unspecified/unknown. Five race/ethnic groups were defined: Caucasian (including non-Hispanic white and Middle Eastern); self-described black (including African American); Asian (including Pacific Islander); American Indian, and other. History of tobacco smoking and preexisting cardiovascular and noncardiovascular comorbid conditions were obtained by linking the DaVita database to the Medical Evidence Form 2728 of the US Renal Data System (11). Available comorbidities included history of cardiac arrest, congestive heart failure, cerebrovascular disease, cardiac dysrhythmia, ischemic heart disease, myocardial infarction, pericarditis, and peripheral vascular disease. In addition, the use of a catheter as the dialysis access during the given calendar quarter (yes/no) was added to case-mix models as a covariate. Patient's postdialysis weight from each hemodialysis treatment was averaged over each 13-wk calendar quarter, and the body mass index (BMI; weight in kg divided by height squared in m2) was calculated and used as a malnutrition-inflammation-cachexia syndrome (MICS) covariate. Most blood samples were predialysis with the exception of postdialysis serum urea nitrogen to calculate urea kinetics. Blood samples were drawn using uniform techniques in all dialysis clinics across the United States and were transported to the central DaVita Laboratory in Deland, FL, within 24 h. All laboratory values were measured via automated and standardized methods in the DaVita Laboratory. Most laboratory values, including complete blood cell counts and serum levels of urea nitrogen, albumin, creatinine, ferritin, and total iron-binding capacity (TIBC), were measured monthly. Serum ferritin was measured quarterly. Hemoglobin was measured weekly to biweekly in most patients. Serum K was measured at least monthly. Kt/V to reflect dialysis dosage and normalized protein nitrogen appearance (nPNA), also known as normalized protein catabolic rate (nPCR), an estimation of daily protein intake, were measured monthly according to Daugirdas et al. (12). Nine laboratory variables were selected to indicate the nutritional state and presence of inflammation, together also known as MICS (13): (1) Serum albumin, which has strong associations with inflammation and prospective mortality in MHD patients (14,15); (2) nPNA as a marker of daily protein intake and an outcome predictor (16); (3) serum TIBC, known to have strong association with subjective global assessment of nutrition (17,18); (4) serum ferritin, a possible inflammatory marker (19,20); (5) serum creatinine, a marker of muscle mass (21); (6) peripheral white blood cell (WBC) count, which is reported to correlate with serum C-reactive protein and to predict survival in MHD patients (22,23); (7) percentage of lymphocytes in the WBC count, a known nutritional marker that was recently shown to have independent associations with mortality in MHD patients (22,24); (8) blood hemoglobin, an outcome predictor in MHD patients (10,18,25); and (9) serum bicarbonate, which is known to correlate with survival (26). Because the dialysis population is a dynamic cohort with a high turnover rate, a nonconcurrent cohort was formed to include all existing MHD patients of the first calendar quarter (q1) and all new MHD patients of the subsequent calendar quarters (q2 through q12). Hence, 12 quarterly data sets were merged using unique patient identifiers. A baseline value was created for each measure by left-truncating the first available 3-mo averaged value of the entry quarter for each patient. Because the conventional (fixed covariate) Cox model inherently ignores changes in predicting variables and other covariates over time, time-dependent Cox proportional hazard regression for 13-wk averaged repeated measures in each calendar quarter was used so that a more realistic clinical scenario is imitated whereby nephrologists assess the current (monthly to quarterly) laboratory measures and decide to change dialysate K bath accordingly. Hence, all laboratory values, Kt/V, nPNA, BMI, and dialysate K bath orders were entered as quarterly-varying repeated measures with up to 12 quarterly values per patient. For each analysis, three models were examined on the basis of the level of multivariate adjustment: (1) Unadjusted model included K categories and mortality data as well as the entry quarter indicators; (2) Case-mix–adjusted models also included age, gender, race and ethnicity, diabetes, vintage categories, primary insurance (Medicare, Medicaid, private, and other), marriage status (married, single, divorced, widowed, and other), standardized mortality ratio of the dialysis clinic during entry quarter, comorbid conditions and tobacco smoking, residual renal function during the entry quarter, and the Kt/V (single pool); and (3) Case-mix–and MICS-adjusted models included all of the mentioned covariates as well as 10 indicators of nutritional state and inflammation, including nPNA and serum albumin, bicarbonate, TIBC, ferritin and creatinine, WBC count, lymphocyte percentage, hemoglobin level, and BMI. Missing covariate data (<5%) were imputed by the mean or median of the existing values. All analyses were carried out via SAS (version 9.01; SAS Institute, Cary, NC). The original 3-yr (July 2001 to June 2004) national database of all DaVita MHD patients included 102,255 cumulative patients. After deleting MHD patients who underwent hemodialysis treatment for <3 mo (13,657 patients from the first 11 quarters and 5348 patients from the last quarter) and 291 patients who had missing data, a total of 82,959 MHD patients remained for analysis. Of these, 74,219 patients had repeated measures of serum K concentrations and 56,984 had both serum and dialysate (bath) K values in all surviving calendar quarters. Table 1 shows baseline demographic, clinical, and laboratory characteristics of the patients according to four a priori selected dialysate (bath) K concentration groups. The majority (63%) of patients underwent MHD against a dialysate K bath in the 1.1- to 2.0-mEq/L range, including the 2.0-mEq/L K bath, the dominant K bath prescription in most patients. Caucasian and older patients tended to require higher K bath concentrations, whereas Hispanic patients had their largest proportion in the low K bath group. The estimated dietary protein intake (nPNA or nPCR) was highest in the low K bath group. Similarly, most nutritional markers including serum albumin and creatinine concentrations were higher in the low K bath and lower in the high K bath groups, indicating better nutritional status in MHD patients who were prescribed lower K baths. Table 2 shows correlations between serum K and some relevant variables in 74,219 MHD patients. 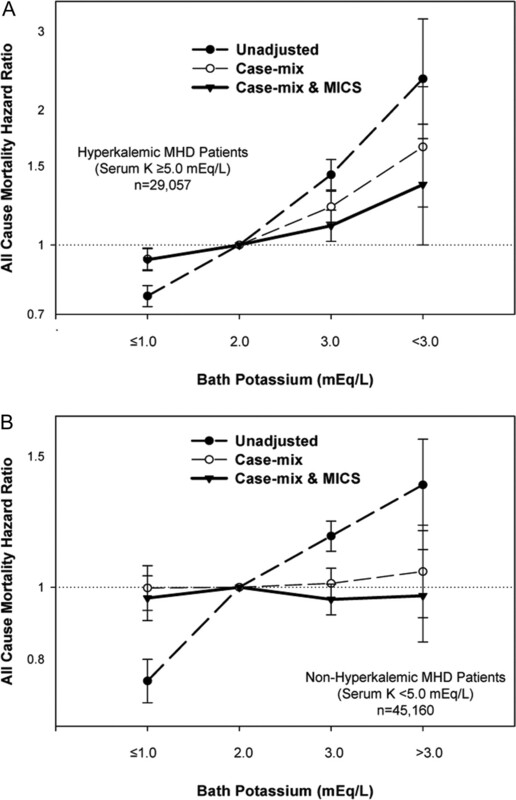 Prescribed K bath was inversely associated with serum K, indicating that patients with higher serum K levels required lower K baths to control hyperkalemia. Nutritional markers had positive associations with serum K concentrations. 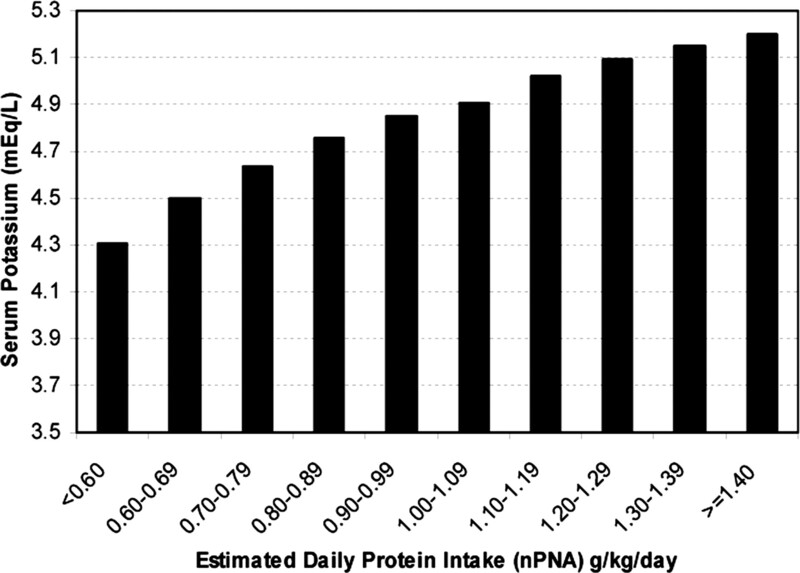 Figure 1 illustrates the association between serum K and dietary protein intake, showing that patients with higher estimated protein intake (nPNA) had incrementally higher serum K levels. Association between predialysis serum potassium (K) concentration and estimated daily dietary protein intake. nPNA, normalized protein nitrogen appearance. Table 3 shows the all-cause and cardiovascular death rates by a priori selected categories of serum K concentration in 74,219 MHD patients. Both crude all-cause and cardiovascular mortality tended to be higher in higher serum K groups. Figure 2 shows the hazard ratios of all-cause and cardiovascular mortality for the aforementioned K categories during a 3-yr period (July 2001 to June 2004). The unadjusted association was U-shaped, with the greatest survival in the 4.6- to 5.6-mEq/L group. The association between low K levels and mortality was mitigated substantially by adjustment for case mix and MICS, but the association between higher K levels and death risk was more robust to exhaustive multivariate adjustment. Cardiovascular mortality (Figure 2) and separate analyses for incident and prevalent patients (Figure 3) showed similar trends. 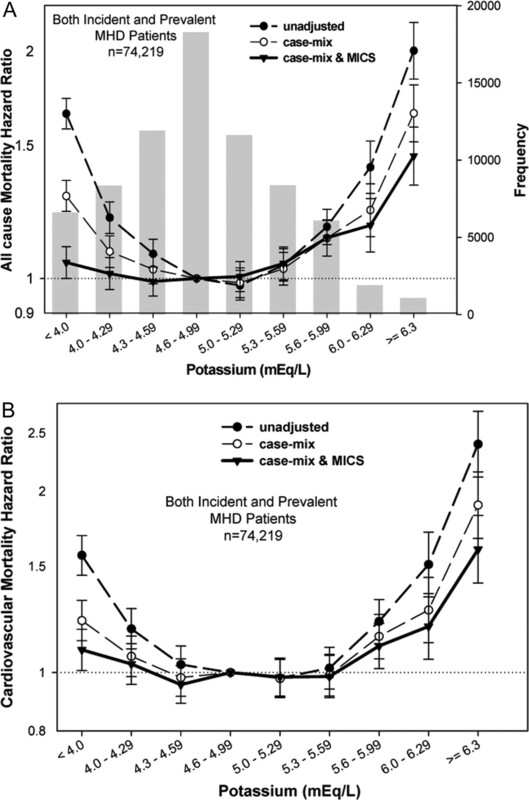 Figure 4 shows the association between hyperkalemia, defined as serum K level ≥5.6 mEq/L, and cardiovascular death risk in the relevant demographic, clinical, and laboratory subgroups of MHD patients in unadjusted and fully (case-mix and MICS) adjusted models. 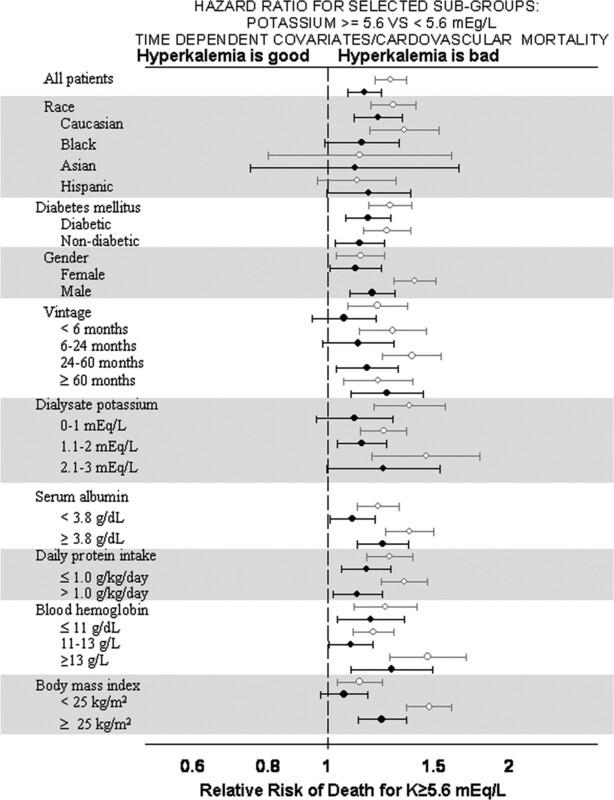 Hyperkalemia was associated with higher death risk in all subgroups. Hazard ratios of all-cause (A) and cardiovascular (B) mortality for predialysis serum K categories in 74,219 maintenance hemodialysis (MHD) patients observed for up to 3 yr. A, includes patient frequencies in the form of a bar diagram in the background. See text for the list of covariates at each level of multivariate adjustment. Hazard ratios of all-cause mortality for predialysis serum K categories in 21,013 incident (A) and 53,206 prevalent (B) MHD patients observed for up to 3 yr. Hazard ratios of cardiovascular mortality for a predialysis serum K concentration of ≥5.6 mEq/L in selected subgroups of MHD patients. Hazard ratios from unadjusted (gray lines) and from fully adjusted (black lines) time-dependent Cox models are shown. Table 4 and Figure 5 show the 3-yr crude mortality rates in four groups of serum K across four categories of dialysate K baths (16 categories). The highest 3-yr death rate was observed in patients with a predialysis serum K of ≥5.0 mEq/L, who were dialyzed against a high dialysate K bath of >3.0 mEq/L (e.g., 3.5 or 4.0 mEq/L K bath). Figure 6 shows the association between prescribed dialysate K bath concentration and survival in two groups of patients on the basis of their predialysis serum K concentration (i.e., <5.0 versus ≥5.0 mEq/L). Higher dialysate K concentration was associated with increased mortality only in the subgroup of patients with predialysis K of ≥5.0 mEq/L after full multivariable adjustment. In the fully adjusted model, hyperkalemic patients who underwent MHD against a dialysate K bath of >3.0 had an increased death hazard ratio of 1.36 (95% confidence interval 1.02 to 1.86; P = 0.046). Additional sensitivity analyses including separate multivariate adjustment for serum K concentrations did not reveal significantly different trends. Table 5 shows changes in the prescribed dialysate K in the last 6 mo of the cohort (January to June 2004) from one calendar quarter to the subsequent quarter, which may represent the most contemporary practice pattern across the United States. The largest proportion of change occurred in those with a high dialysate K bath of >3.0 mEq/L, in whom 19% of patients were switched to lower dialysate K bathes in the subsequent calendar quarter. Three-year crude mortality rates in 16 groups of serum and dialysate K concentrations. Hazard ratios of all-cause mortality for dialysate K concentration categories in subgroups of MHD patients with a predialysis serum K concentration of <5.0 mEq/L (A) and of ≥5.0 mEq/L (B). We examined the association of predialysis serum K level and dialysate K concentration with mortality (all-cause and cardiovascular) in a large cohort of MHD patients. Both hypokalemia and hyperkalemia were associated with higher unadjusted all-cause and cardiovascular mortality. Adjustments for case mix and MICS mitigated the associations between hypokalemia and mortality, but hyperkalemia remained associated with higher all-cause and cardiovascular mortality despite these adjustments. Both higher and lower dialysate K concentrations showed associations with mortality in unadjusted models; these associations were reduced by the adjustments made in the overall patient group. In patients with predialysis serum K of ≥5.0 mEq/L, the use of a higher dialysate K bath remained associated with higher mortality despite detailed adjustments for potential confounders. In previous studies, both hypokalemia (1) and hyperkalemia (1,2) were shown to have associations with higher mortality in MHD patients. These associations were detected while examining a larger number of predictors of mortality, and no analyses aimed at elucidating the role of abnormal serum K concentrations in more detail. The plausibility of such associations seems obvious on the basis of the physiologic role that K plays in maintaining the resting cell membrane potential, neuromuscular excitability, and cardiac pacemaker rhythmicity (27). There is a significant risk for cardiac arrhythmias during both hypo- and hyperkalemia (28–32). The human body has apparently redundant defense mechanisms aimed at maintaining its K homeostasis. These involve renal and extrarenal mechanisms that affect both the amount of K that is being excreted and the degree of distribution between the intra- and extracellular space (33). In patients with kidney disease, the renal mechanisms aimed at ensuring K-mass balance are impaired (3). This impairment culminates in patients who require MHD, in whom extracellular hyperkalemia can develop as a result of net positive K-mass balance combined with impaired redistribution responses seen in uremia (3,34,35), and hypokalemia can be a result of decreased dietary intake and/or increased extrarenal losses. Dialysis therapies are meant to restore K balance, but in the case of MHD, this is usually achieved through intermittent treatments delivered three times a week and hence often results in large fluctuations in serum K concentration. Despite the plausible electrophysiologic considerations, the association between predialysis serum K abnormalities and mortality in MHD could be confounded by several factors. First, predialysis serum K abnormalities could be mere surrogate markers of other underlying conditions predisposing to higher mortality. Hypokalemia could be the result of low dietary intake, which could be related to such morbid states as the MICS. We found that hypokalemia was not associated with higher mortality after adjustment for case mix and MICS; therefore, it is possible that it is a surrogate marker of underlying comorbid conditions. Nevertheless, because the arrhythmogenic potential portended by a lower serum K is unquestionable, we argue that hypokalemia may still play a role in the chain of events that results in the higher mortality associated with malnutrition and inflammation in MHD patients; therefore, comprehensive strategies aimed at improving the nutritional status of such patients should also address the correction of serum K levels. Hyperkalemia could also be accompanied by other abnormalities that are also associated with higher mortality, such as hyperphosphatemia (9,36). Hyperkalemia, however, remained associated with mortality even after extensive adjustment for potential confounders. It is unclear whether the higher mortality associated with predialysis serum K abnormalities is related to the predialysis abnormality itself or its treatment during dialysis. MHD patients with extreme hyperkalemia are routinely treated with dialysate baths that contain very low K concentration and hence could experience transient hypokalemia that develops in a relatively rapid manner; this consideration does not apply to patients with predialysis hypokalemia, because supraphysiologic dialysate K concentrations are not used in practice. Indeed, avoiding a high intradialytic K gradient resulted in significantly fewer arrhythmias in a study that compared the routinely used fixed-dialysate K concentration strategy with one using a variable dialysate K concentration treatment (37). Variable dialysate K concentrations are unfortunately not routinely used in clinical practice, which poses a dilemma when treating patients with predialysis hyperkalemia: Should one use a higher (fixed) dialysate K concentration to avoid rapid shifts in serum K level and risk inadequate K clearance and subsequent hyperkalemia or administer dialysates with low K concentration to control K-mass balance while running the risk for intradialytic arrhythmias? Our results support the latter strategy, because we found no association between a low dialysate K concentration and mortality after adjustment for surrogates of a poor nutritional state, but the use of a higher dialysate K bath was significantly associated with increased mortality in the subgroup of patients with predialysis hyperkalemia. Nevertheless, these findings may be the result of confounding by medical indication. The vital importance of predialysis hyperkalemia is also supported by the increased incidence of sudden deaths noted on the first days of the week (38,39), when the severity of hyperkalemia is most marked. Our results emphasize the need for adjusting dialysate K concentrations on the basis of the knowledge of predialysis serum K levels. The relative infrequency of predialysis serum K monitoring (despite the marked fluctuations seen as a function of actual dietary intake) in outpatient MHD may be one of the glaring inadequacies of our routine clinical practice. The impact of a strategy using more stringent predialysis serum K monitoring with appropriate adjustments in dialysate composition will have to be explored in the setting of a clinical trial. Our study has shortcomings that need to be mentioned. The retrospective and observational nature of our analyses allows for the detection of associations but is no substitute for randomized trials. We were able to account for the potential effect of a multitude of confounding variables, but residual confounding may still be present. We examined the associations of predialysis serum K levels with mortality, but we could not account for the potential impact of postdialysis K levels; therefore, we could only speculate about the possible role of such abnormalities. We showed that hyperkalemia was associated with both all-cause and cardiovascular mortality, but we did not examine whether the cardiovascular deaths were specifically related to arrhythmias; the presence of such an association would have supported a causal role for hyperkalemia in the higher mortality seen. A predialysis serum K of 4.6 to 5.3 mEq/L is associated with the greatest survival in MHD patients. Predialysis hyperkalemia is associated with higher all-cause and cardiovascular mortality in patients who are on MHD after detailed adjustment for potential confounding variables. Hyperkalemic patients who undergo MHD against lower dialysate bath may have better survival. Our study re-emphasizes the vital nature of K homeostasis and underlines the importance of interventions aimed at achieving a normal serum K level in patients who receive MHD. The role of predialysis hyperkalemia seems especially important, and adequate treatment strategies are needed to achieve an appropriate K-mass balance. Although appropriately prescribed dialytic therapies still form the cornerstone of such interventions, dietary strategies should also be used to avoid large fluctuations in serum K concentration while maintaining adequate nutrition. The potential beneficial impact of alternative dialysis strategies that would ensure better control of hyperkalemia and prevent marked fluctuations in serum K concentration (e.g., daily hemodialysis, peritoneal dialysis) should be examined in future studies. This study was supported by research grants from the American Heart Association (0655776Y); the National Institute of Diabetes and Digestive and Kidney Diseases (R01DK078106); the National Center for Research Resources (RR18298); DaVita Clinical Research; and philanthropist Harold Simmons. This study was presented in part at the annual meeting of the American Society of Nephrology; November 14 through 19, 2006; San Diego, CA. Does Timing of Dialysis in Patients with ESRD and Acute Myocardial Infarcts Affect Morbidity or Mortality? Is controlling phosphorus by decreasing dietary protein intake beneficial or harmful in persons with chronic kidney disease?